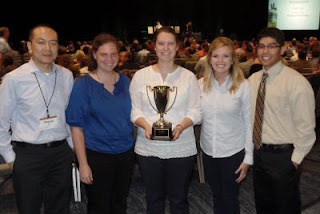 For the first time since 1997, the University of Kentucky Department of Agricultural Economics’ Academic Bowl team brought home the national championship. The double elimination tournament was held at the Agricultural and Applied Economics Association’s annual meeting in Boston from July 31-Aug. 2 and featured 34 teams from 18 universities. The members of this year’s championship team are Erica Rogers, Daniella Straathof and April Winebarger. Will Fox, Megan Harper and Rachel Hart comprised the other team from the UK College of Agricultural, Food and Environment. The team’s undefeated first-place achievement follows last year’s runner-up performance at the event and several years of constant improvement under the guidance of agricultural economics professor Wuyang Hu and coach Jerrod Penn, a doctoral student.